In 1988, a young Peter Quill witnesses his mom dying of brain cancer. Distraught, he runs away and is immediately abducted by aliens. 26 years later, Quill (Christ Pratt), now going by the alias “Star-Lord” (who? ), is an intergalactic thief and con-man on the hunt for a powerful orb sought by his former abductor Yondu Udonta (Michael Rooker) as well as hardline space-racist Ronan the Accuser (Lee Pace). 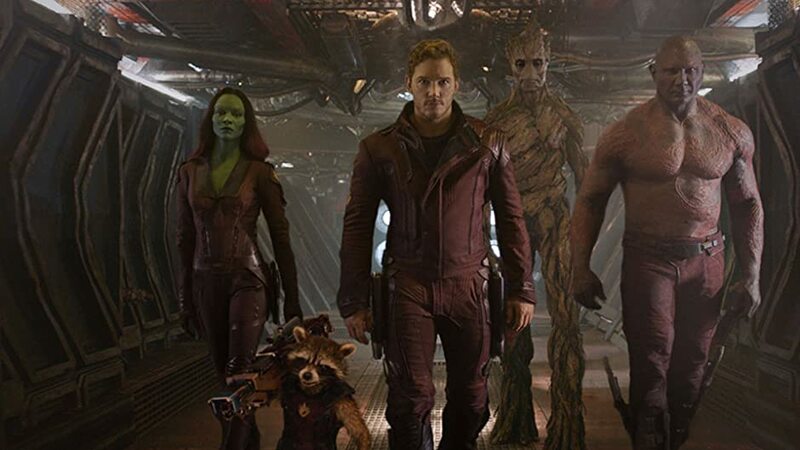 His pursuit of the orb lands him in the crosshairs of space-assassin Gamora (Zoe Saldana) and bounty hunters Rocket (Bradley Cooper) and Groot (Vin Diesel’s voice). The four misfits escape from space-jail with the help of literalist strongman Drax the Destroyer (Dave Bautista), and, upon finding out the true power of the orb, race to prevent Ronan from destroying a planet. Guardians of the Galaxy was the one Marvel movie (besides its sequel) that I was worried about showing my mom. I’m a humongous Star Wars fan and I’m certain that she regrets ever taking me to see that movie. So, given that Guardians, in simplistic terms, is just Marvel’s Star Wars, I was hesitant to show it to her. This is combined with the fact that Guardians throws a LOT of strange concepts at the audience in a relatively short amount of time with exposition inserted sparingly and only when absolutely needed. The movie also moves at a blistering pace (Lee Pace) and only gives the audience limited time to catch their breath before another big action sequence or joke. However, my mom sat through the whole thing and picked up far more than I would’ve given her credit for. So, sorry for underestimating you, mom. I’ve said multiple times before that a Marvel movie is only as good as its villain. But Guardians, being the groundbreaker it is, flips the script on this one. Lee Pace’s Ronan is a cardboard cut-out character with no reasonably explain motivation or defining character traits. My mom barely paid attention to him until the end, which is fair, because’s barely in this movie until the end. Guardians gets a full pass on the villain side because appeal lies not within its bad guy or plot (both of which are pretty thin), but within its main characters and their dysfunctional relationships. And this is what stuck with my mom. Despite a relatively large cast of characters, she was able to remember everyone’s name (!!!) even Gamora, whose name isn’t a real name, and Star-Lord, whom she called “Pete”. Guardians’ other popular feature is its quirky, fun style that emphasizes a badass soundtrack and boat loads of jokes. My mom didn’t comment too much on the soundtrack, although she recognized a few songs. What had me worried throughout the majority of the movie’s runtime, is that she did not laugh at any of the jokes. That is, except for the dance off. That drew an audible chuckle. However, at the end, she mentioned that she liked how they made the movie in a “funny way”. So I guess I shouldn’t have been worried about showing my mom Guardians as much as I did. What I should have been worried about instead was my rewatching taking the movie down a few of my own, personal pegs. Its pace and lack of exposition and breathing room make the movie not as good as I remember it. But who cares what I think? Close to the end of the movie, when the group was discussing their final plan amongst themselves, my mom pointed at the screen and asked if that was Bradley Cooper. I was impressed that she recognized his voice. But it became clear that she thought Chris Pratt was Bradley Cooper. When I corrected her she said she wondered why he looked different. Mom didn’t bat an eye and knew Peter was gonna switch out the stone with Yondu. Duh. I had to remind her once again about who Thanos was and the significance of the Infinity Stones. I left the Orb toy that came with the Phase 2 Box Set lying around, and she freaked out when she saw that it “became real”. Dancing Groot: She thought it was cute. Howard The Duck: She had no idea what the hell was going on here. Understandable.